Terrell and Kelly will be arraigned on February 24, after 2:30 p.m., at the Juneau County Justice Center, 200 Oak St., in Mauston, Wisconsin. On February 25, at 9:00 a.m., Mary Beth Schlagheck will be tried for having crossed the line at Volk Field in August of 2015. Hers is the last of seven trials stemming from nonviolent civil resistance actions at Volk Field that were undertaken as the culmination of the “Let It Shine” walk from Madison to Volk Field. The witness of the activists who have protested at Volk Field, and who have testified so eloquently in court, inspired Brian’s and Kathy’s action. 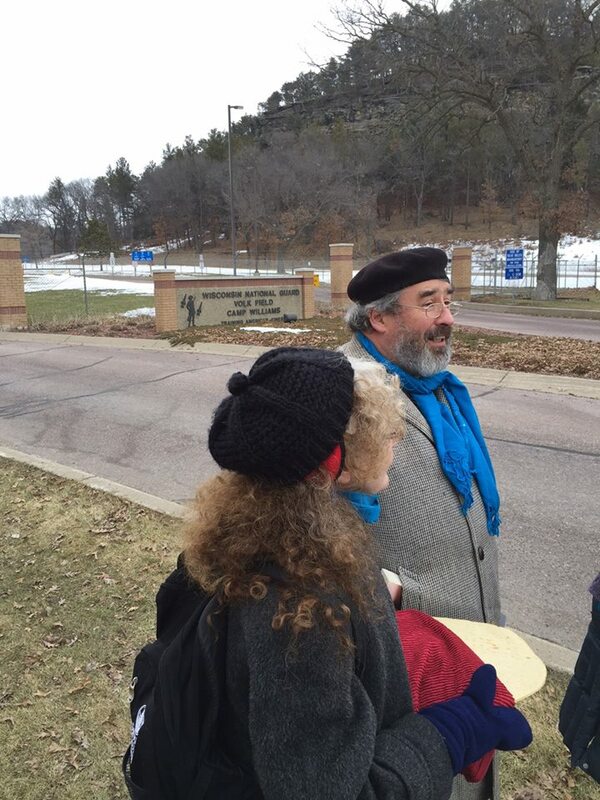 On February 24, two co-coordinators of Voices for Creative Nonviolence, Brian Terrell and Kathy Kelly, appeared before Judge Curran from the Juneau County Jail via the jail’s video link. The two had been held overnight. They were served documents charging them with trespass at the “dwelling” of Volk Field. Pilots train at Volk Field to operate Shadow Drones over other countries. Kelly told Judge Curran that she wished to plead no contest and that she would not be able in conscience to pay a fee, and that she preferred not to promise that she’d return to the court since she didn’t believe she had committed a crime in the first place. “Oh, I get what’s happening here. You have some people out there who will give you a gold star and a pat on the back for being so courageous,” said Judge Curran. He then said he would not impose a cash bond and he set a pre-trial conference date for March 23 even though Kelly had already indicated that she wished to plead no contest and was not seeking a trial. Kelly and Terrell were released after signing personal recognizance bonds. On February 25, they returned to the court to attend Mary Beth Schlagheck’s trial for a protest at Volk Field last August. Due to an emergency hospitalization of one of the state’s witnesses, her trial was postponed. Following the hearing, District Attorney Michael Solovey agreed to an informal conference with Kelly and Terrell. He discussed a motion Terrell had filed that morning to dismiss the criminal charge of trespassing at a dwelling. Mr. Solovey said he expected the charge to be changed to the less serious forfeiture of trespassing on land. He was ready to accept a plea of no contest when he learned at the end of the conference that the U.S. Air Force was asking for another criminal charge of disorderly conduct, alleging that Kelly and Terrell had disrupted traffic in their protest. Kelly and Terrell told him a video taken by Joy First would verify that Kelly and Terrell did not disrupt traffic.